As you may have already noticed, you can now post reviews on our mobile website! To write a review on a product, tap the "Review" tab below the "Add to My Favorite" button on the product details page. 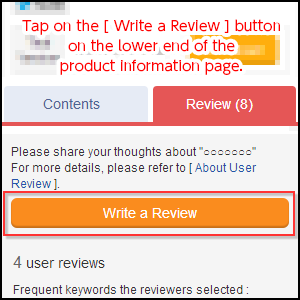 Tap the "Write a Review" button to access the review posting page. You can earn member points when your review appears on DLsite.com. Please share your voice with other users! For more details, please refer to [ About User Reviews ]. You can find the PC version of the page [ here ]. From 05:00 p.m. on January 29th 2016 (Japan Time - UTC+9:00), we were experiencing intermittent problems related to the 3-D secure service ("Verified by VISA" offered by VISA) which result in failures in making payment with VISA credit cards. The problem is now solved; however, as a temporary response to this issue, we have temporarily removed the 3-D secure procedure from the checkout process of payments by credit card. We apologize for the inconvenience caused by this problem and thank you for your understanding. We are glad to announce that we are offering 10% Reward Points Campaign from today February 1st through April 4th! Get 10% reward points on almost everything you buy! - Professional e-books on the DLsite G section are not covered in this campaign. - Only DLsite.com members can participate in this campaign. Consider creating an account with us if you haven't yet!